Make piecrust and press enough into bottom of the jars to cover. Bake in 350 degree oven for 45 minutes, or until crust is lightly brown. Remove from oven & enjoy. 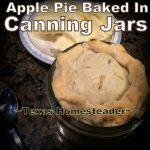 NOTE: If this dessert is for supper tonight, you can place canning jar lids on the completely cooled pies for short-term storage.